For fans of the Canadian Hockey League, nights like Tuesday are the ones you don’t forget. Two titans fell in thrilling Game 7’s as the defending Mastercard Memorial Cup Champion London Knights where ousted in overtime by the Erie Otters on Warren Foegele’s winning goal. London netminder Tyler Parsons was terrific once again, turning aside 58 shots to keep the Knights in the series to the bitter end. On the heels of their CHL record fourth straight 50-win season, the Otters are headed to the OHL’s Western Conference Final for a fourth straight year. The defending QMJHL President Cup Champion Rouyn-Noranda Huskies also saw their title defence come to an end as Chicoutimi Saguenéens defenceman Olivier Galipeau tied the game shorthanded with 1:11 remaining before scoring the winner 4:22 into overtime. Chicoutimi overcame a 3-1 deficit in the last half of the third period on the road as Kelly Klima had a pair of goals in the comeback to send the Sags to their first QMJHL Semi-Final since 2012. Elsewhere in the QMJHL, The Blainville-Boisbriand Armada rolled over the visiting Acadie-Bathurst Titan 7-1 in Game 7 as Alex Barré-Boulet stole the show with three goals and an assist. 2017 NHL Draft prospect Joel Teasdale also contributed, netting two goals and two assists while Columbus Blue Jackets first round pick Pierre-Luc Dubois pitched in with three helpers. Bathurst’s Cinderella run comes to an end after the Titan reached the second round of the QMJHL Playoffs for the first time since 2008. Not to be overlooked, the Western Hockey League saw its second Game 7 of the second round come to an end in dramatic fashion. The Lethbridge Hurricanes are into the Eastern Conference Final for the first time since 2008 after captain Tyler Wong lifted them over the Highway 3 rival Medicine Hat Tigers on a shorthanded rush 3:02 into overtime. Dylan Cozens knotted the score at four with 2:43 remaining in the third period, setting the stage for overtime where the Canes came through. Goaltender Stuart Skinner came up with a big save at one end, sending Lethbridge back in transition as Wong wristed a quick release over the shoulder of Michael Bullion for a 5-4 victory. The Regina Pats took care of the Swift Current Broncos in Monday night Game 7 action, storming back to overcome a 3-1 series deficit with a 5-1 home ice win behind a pair of goals from Sam Steel and Austin Wagner. With those series settled, 12 teams remain in the CHL Playoff picture as the 2017 Mastercard Memorial Cup in Windsor inches closer on the calendar. Beginning where we left off in the WHL, the first place Regina Pats will square off with the team they upset in last year’s WHL Playoffs as the Lethbridge Hurricanes look for redemption in the Eastern Conference Final. The two clubs split the season series with two wins apiece and both enter the series off lengthy seven game series battles in the second round. Though they’ve been banged up with injuries in these playoffs, the Hurricanes have found a way to persevere and will look to continued contributions from leading scorers Wong (11-11–22), Buffalo Sabres prospect Giorgio Estephan (8-11–19) as well as star defenceman Brennan Menell (4-9–13) against a star-laden Pats squad that got all they could handle from the Swift Current Broncos. The Western Conference Final is a repeat of last year’s edition as the Seattle Thunderbirds begin on home ice against the ever-competitive Kelowna Rockets who have reached the third round for a fourth straight year. The T-Birds come off a four game sweep of the division rival Everett Silvertips, an outcome that prompted a coaching change in Everett this past week after Seattle took three-straight one-goal decisions before a 5-1 victory at home in Game 4. Matt Barzal returned to the Seattle lineup to record seven points (4-3–7) in four games as the Thunderbirds are firing on all cylinders once again. Kelowna has benefitted from the contributions of reigning CHL Player of the Week Reid Gardiner who leads the WHL Playoffs with 22 points (12-10–22). Despite a suspension to standout blueliner Cal Foote, the Rockets got by the Portland Winterhawks in five games, outscoring them 24-12 in the process. 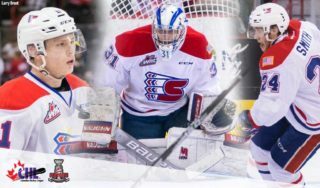 Veterans Nick Merkley, Dillon Dube, Devante Stephens and Rodney Southam have all gained valuable experience going deep into the WHL Playoffs as the Rockets continue to be one of the CHL’s most consistently competitive franchises. Moving to the Ontario Hockey League, the Eastern Conference Final sees the undefeated East Division Champion Peterborough Petes taking on the talented Central Division Champion Mississauga Steelheads. The Petes are off to an 8-0 start in the playoffs for the first time since 1990 and have reached their first conference final since the year they last won an OHL title in 2006. Overage veteran Steven Lorentz leads the Petes in scoring (8-4–12) while Tampa Bay Lightning prospect Matt Spencer leads the OHL Playoffs with a plus/minus rating of plus-16. The Petes have earned successive sweeps of the Niagara IceDogs and Kingston Frontenacs, getting strong goaltending from Vaughn CHL Goaltender of the Week Dylan Wells in the process. Mississauga enters action off a 4-1 series victory over the Oshawa Generals. Fifth-year offensive dynamo Spencer Watson (10-7–17) leads the attack for Mississauga while New Jersey Devils first rounder Michael McLeod (6-11–17) has had his moments as well. 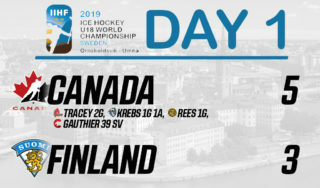 The Trout have had scoring from the back end as Vili Saarijarvi (4-6–10), Nicolas Hague (1-9–10) and Stefan LeBlanc (1-7–8) have been a presence in all three zones. Matt Mancina and rookie Jacob Ingham have shared the load in goal, with Mancina taking over in the second round after Ingham came down with an illness. The OHL’s high-flying Western Conference, one that featured three different 100-point teams and a fourth with 99 to end the year, sees just two of those clubs left standing as the regular season champion Erie Otters will battle the hard-hitting Owen Sound Attack. The Otters feature the leading scorer of the OHL Playoffs in Alex DeBrincat (6-16–22) while Tampa Bay Lightning prospect Taylor Raddysh (5-13–18) follows close behind. One of Erie’s main storylines has been in goal, where backup Joseph Murdaca came on in relief twice during the London series to backstop the Otters to comeback victories including a 17-save performance in Tuesday’s Game 7. Owen Sound overcame a 2-0 series deficit with four straight wins against the Sault Ste. Marie Greyhounds in round two. A model of consistency all season, the Attack are backed by the fine goaltending of Montreal Canadiens prospect Michael McNiven and featured the OHL’s best power play this past season, a man advantage that operated at a slightly higher percentage than second place Erie’s. After leading the club in scoring during the regular season, snipers Petrus Palmu (10-6–16) and Nick Suzuki (7-9–16) continue to lead a dangerous Owen Sound offence that also features the underrated Kevin Hancock (6-4–10) and captain Santino Centorame (3-8–11) on the blue line. The QMJHL sees the upstart Chicoutimi Saguenéens facing another giant in the Saint John Sea Dogs who have yet to lose in the postseason. Central to Chicoutimi’s playoff success has been Vancouver Canucks prospect Dmitry Zhukenov who leads team scoring with 16 points (5-11–16). Big Carolina Hurricanes prospect and Canadian National Junior Team member Nicolas Roy (6-7–13), overage scorer Joey Ratelle (5-5–10) and former QMJHL Champion Olivier Galipeau (4-7–11) have given head coach Yanick Jean plenty to work with against playoff opponents in Victoriaville and Rouyn-Noranda. The Sea Dogs have steamrolled their way into the Semi-Finals as star defenceman Thomas Chabot has continued to turn heads with 13 points (3-10–13) over eight games. Tampa Bay Lightning draft pick Mathieu Joseph (7-8–15) leads the team in playoff scoring as the Sea Dogs are into the final four for a second straight year. Saint John took both regular season meetings against Chicoutimi, winning by scores of 1-0 on January 20th and 4-2 on February 18th. The Blainville-Boisbriand Armada come off a seven game series victory to face a fresh Charlottetown Islanders club that took care of the Cape Breton Screaming Eagles in their second straight playoff sweep. The Armada have relied heavily upon QMJHL Playoff scoring leader Alex Barré-Boulet (10-11–21) after being forced into some uncharacteristically high-scoring outcomes in their second round series with Acadie-Bathurst. After posting a QMJHL-low 171 goals against during the regular season, the Armada surrendered 17 goals over their first four games against the Titan before locking things down to allow just three over Games 5, 6, and 7. The Armada feature a capable power play operating at 30 percent in the QMJHL Playoffs, one they will need against Charlottetown’s 92.9 percent penalty kill as Jim Hulton’s undefeated Islanders have been playing some very good hockey. Pittsburgh Penguins prospect Daniel Sprong (7-7–14) and Ottawa Senators first rounder Filip Chlapik (3-11–14) give Charlottetown dangerous scoring options on each of their top two lines while a back end that features Carl Neill (1-5–6), Nicolas Meloche (2-3–5) and Guillaume Brisebois (0-4–4) has shown itself capable of being an effective weapon on both the offensive and defensive side of the puck. If it’s anything like the second round, the Conference Finals of the OHL and WHL and the Semi-Finals of the QMJHL are shaping up to can’t-miss encounters between the best teams from coast-to-coast. Five teams including the Regina Pats (1), Erie Otters (2), Saint John Sea Dogs (3), Owen Sound Attack (4) and Charlottetown Islanders (8) remain from the final edition of the CHL Top-10 Rankings posted on March 22nd along with honourable mentions in the Seattle Thunderbirds and Blainville-Boisbriand Armada. 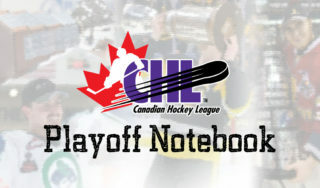 The third round of the 2017 CHL Playoffs gets underway on Thursday in the OHL before the WHL and QMJHL get started on Friday. Play #CHLPredictor and choose playoff winners from across the Canadian Hockey League! Register through the new #CHLFanbase module, earn points for correct picks, and have the chance to win great prizes including a trip to the Mastercard Memorial Cup.